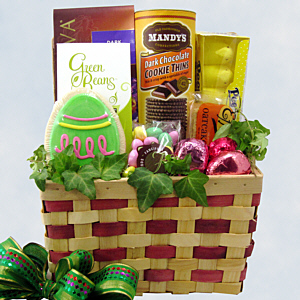 Give someone eggsactly what they want with this happy Easter Basket, they will be eggstatic. They won't have to hunt for eggs, they are easy to find nested in this ivy rimmed basket: Three foil wrapped eggs filled with Chocolate Buttercream, Peanut Butter and Marshmallow, Chocolate Jordan Almonds, Egg Shaped Sugar Cookie, Green Beans (natural jelly beans), Godiva Dark Chocolate Truffles, Mandy's Dark Chocolate Cookie Thins, Effie's Oat Cakes and of course, Peeps. This will make their Easter eggstra special.